When quarantining newly acquired fish, keeping them separated from your existing fish community is only the first step. They should also be treated for diseases that they may be carrying but not showing any symptoms of. Most publications and websites about Goldfish recommend quarantining any newly acquired fish before introducing them into your existing fish community. The quarantining process is explained as keeping the fish completely separated from all other fish and filtration systems for a period ranging from several weeks and up to a month. (Note: Most Goldfish disease progression is affected by water temperature, so quarantine times need to be longer in winter). If a fish is quarantined for several weeks in perfect water conditions, fed a variety of foods including some live, and hasn’t developed a fungal, bacterial or parasitical infestation from anchor worm or lice, then is it safe to assume the fish is healthy? Possibly but what about protozoan parasites, flukes or tape worms? 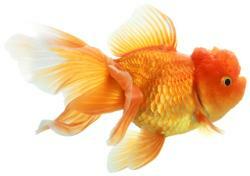 Goldfish can quite happily carry these parasites without showing any symptoms apart from the occasional scratch. (Note, white spot or Ich disease can often be present in the gills of fish without ever showing a single white spot on the body). Perfect water conditions and an excellent diet high in live foods will enable a fish to resist or overcome any bacterial or fungal attack. Perfect water conditions also help the fish resist flukes and protozoan parasites, but it doesn’t eliminate them entirely. Assume any new fish is carrying parasites. I use un-iodized plain cooking salt as a first line of treatment. At a 0.3% concentration (3 grams per liter or 1 tablespoon per gallon US or UK) it is strong enough to kill 7 different protozoan parasites. For a safety margin against salt resistant strains, after 24 hours I increase the concentration to 0.6%. After a week I reduce the salt concentration back down to 0.3%. High salt concentrations for long periods can stress the kidney. There are several chemicals that can be used for flukes, but some like formalin are fairly toxic. I prefer to use a Praziquantel based treatment that is non-toxic to fish, plants or biological filters. Several treatments 4-5 days apart are required as juvenile flukes can emerge from the dead parent’s body. A bonus is it is also effective against tape worms. The reason we Quarantine new fish is usually to prevent parasites being introduced into our existing fish community. Rarely is it discussed that our fish may actually be carrying parasites that the new fish hasn’t been exposed to. If your fish are carrying a parasite, over time a closed community will build up immunity to the parasite. I am specifically referring to protozoan parasites or flukes. If a new fish is introduced into that community, and it hasn’t any immunity, it is likely to contract a life threatening infestation. This is why newly quarantined fish can suddenly become ill, even though you know the fish was disease free when it was introduced into the community. It is a good policy to treat your existing fish for protozoan parasites and flukes, even if they aren’t exhibiting any symptoms. Comments? Ideas? Feedback? I'd love to hear from you. Just reply to this e-zine and tell me what you think, or what topics you want covered.